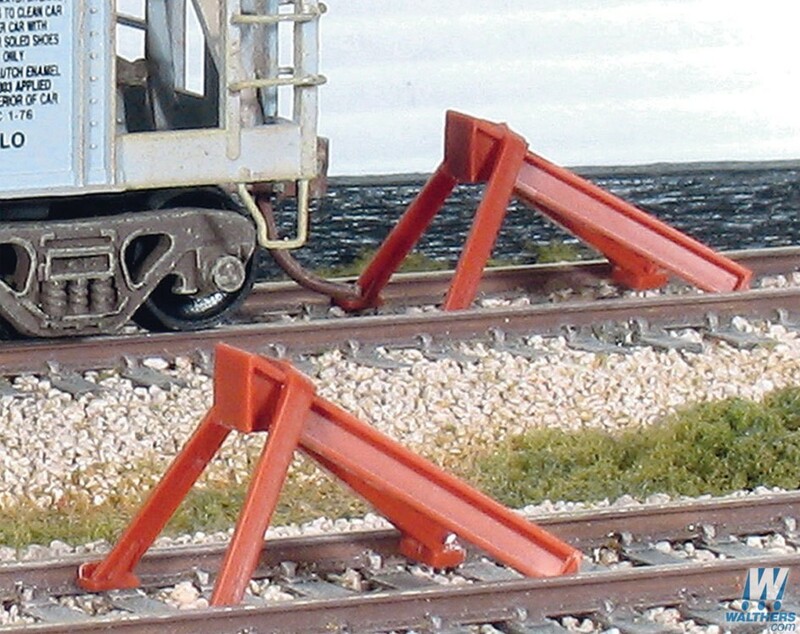 Years ago, when laying track, I needed to get some bumping posts. Of course, being rather unglamorous, they don't show up in photos much. What kind to get? In this photo (cropped from one taken on the other side of Main Street), we catch a glimpse of one just behind Embassy Diner. 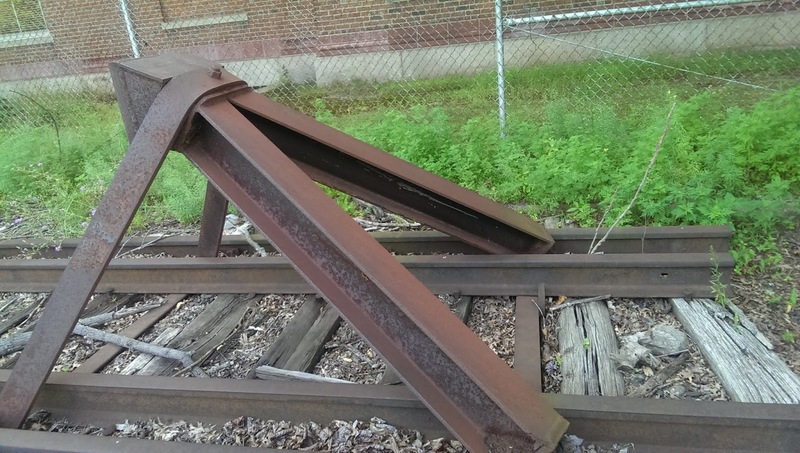 It resembles a Hayes bumping post, although it's not. 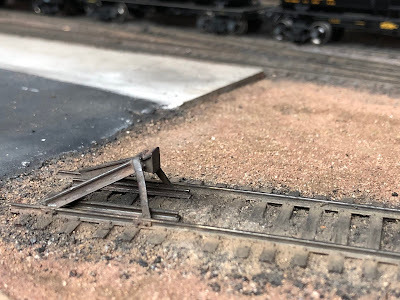 So with two (and a part) prototypes to start from, I needed to see what I could find in HO scale. Since I don't have any complete pictures of any actually in New Britain, I decided to go with the Hayes type like in Waterbury. 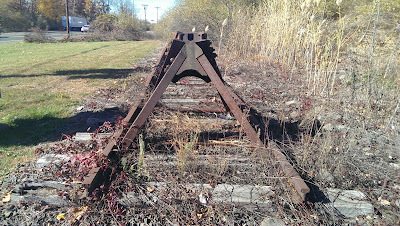 I haven't found an HO scale model of the Durable one that's in Plainville. 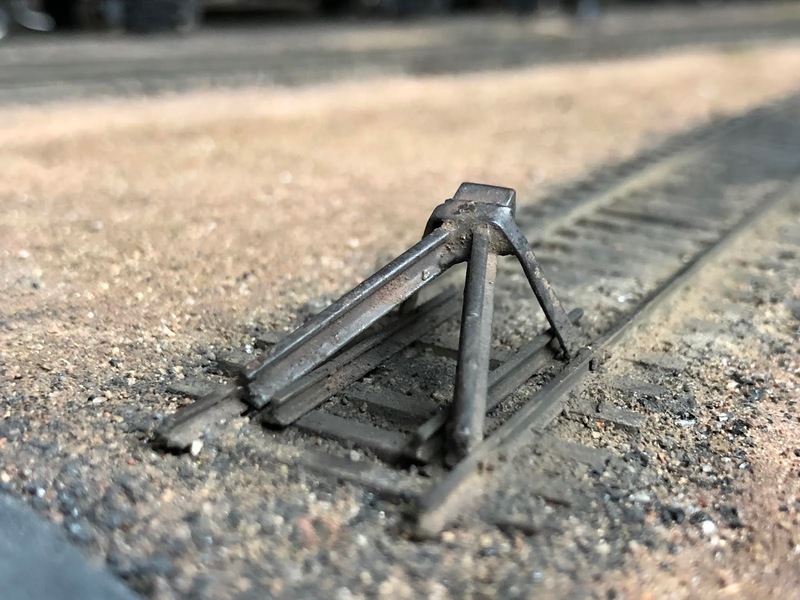 The Tichy one is quite nice, and even comes with small bolt plates that go on the outside of the rail (not pictured). 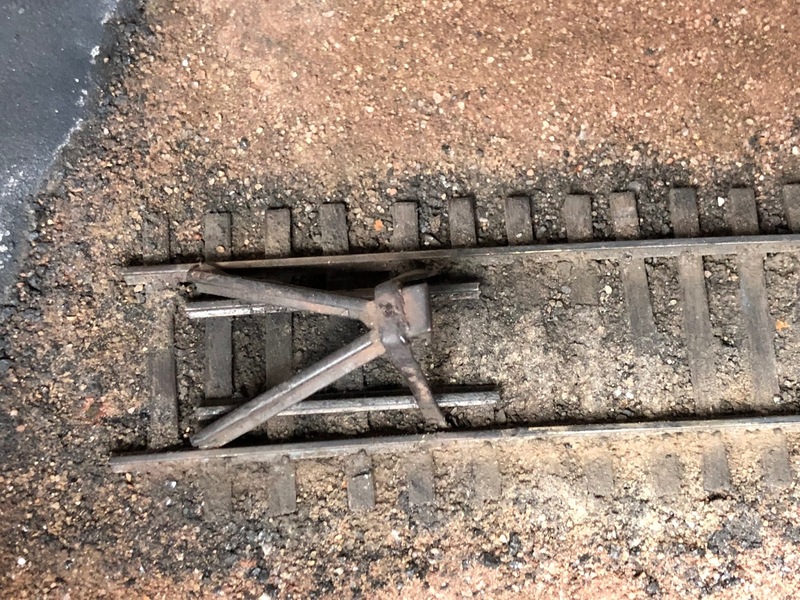 But I think the head (and strap) looks better on the Peco ones, and it also has the bolt attachment where the strap wraps around the head (not difficult to add though). 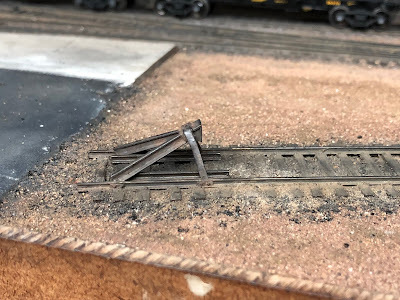 The issue for me, though, is that I need them in a number of places where the track ends at the edge of the layout. I'd prefer a brass one that I can solder to the rail to make them truly work as a bumper. The Tichy one might be sufficient with the crosspieces between the ties, but it's still assembled from several parts and I wanted to be sure they would hold up. If the Peco ones had included the crosspieces, I might have tried that since they otherwise look fantastic. 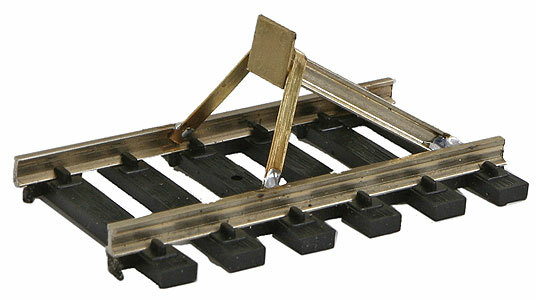 Regardless, Tomar does make a brass model. The biggest issue with this, though, is that there is no head. 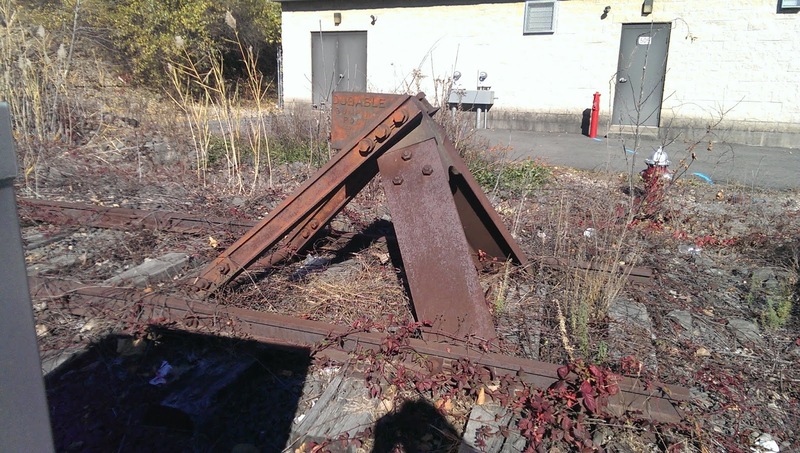 Just a flat piece of brass in its place. My solution? 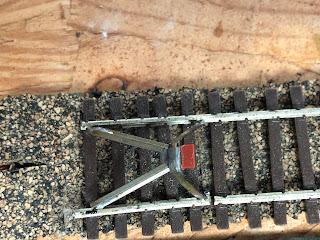 Remove that (it's easy enough to do by grabbing a corner with a pair of needle-nose pliers and rolling it to peel it off), and I replaced it with the head from the Peco model, along with adding a nbw-casting to the strap. This also has the advantage of making sure the bumper itself cannot cause a short. I then desoldered it from the piece of rail it's attached to, and soldered it to the end of the track I'm using so I can avoid the difference in appearance from the ties and the need for rail joiners here. 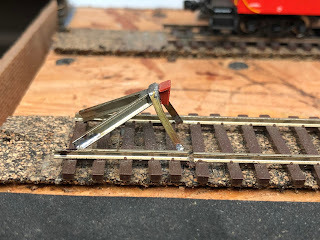 I cut a gap in one rail to avoid shorts. To fill the gap, I use strip styrene of whatever size is a tight fit (or several pieces if needed), glued with CA. Once that's dry, I trim with a scalpel to the shape of the rail. Once painted and weathered it's virtually invisible. 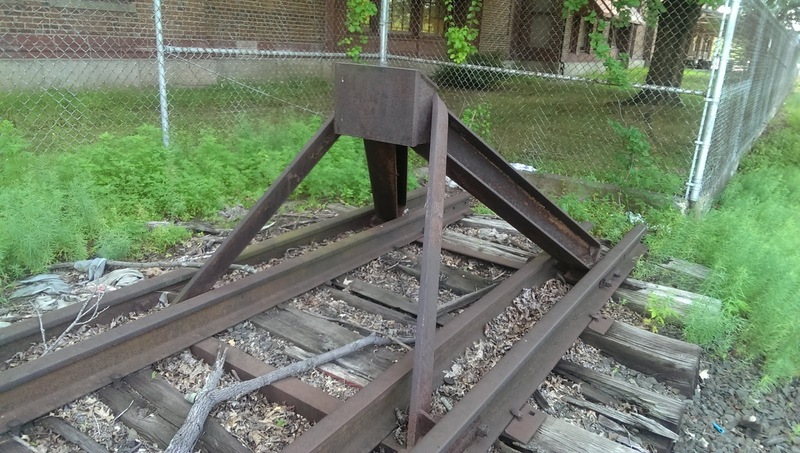 You can clearly see the gap in one rail in these pictures. I've noticed that some prototypical installations have the two short pieces of rail like the Waterbury Station one does, others do. 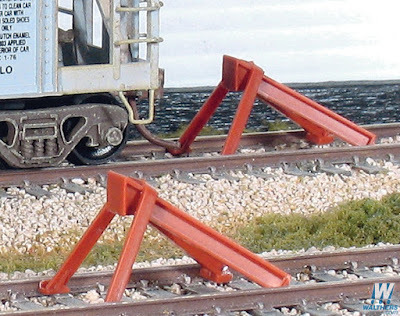 I also added the bolt plates to the outside of the rails. 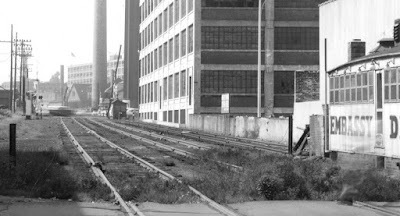 The finishing is basically the same process I use for the rails. Everything is sprayed with Rustoleum Camouflage paint, then weathered using Pan Pastels. Mostly black, dark gray, and primarily raw umber (including shade and extra dark). I used sparing amounts of the various iron oxide colors. They look too red to my eye compared to photos, but I think a small amount works well for variation. I also used this as an experiment for rust finishes, particularly with adding some additional texture and areas of newer rust to contrast with the old rust. To do this, I dabbed on a bit of Future floor polish, then sprinkled some very find sand, into the Future. I also dabbed in Pan Pastel colors while it was still wet, and did multiple layers in a few places. 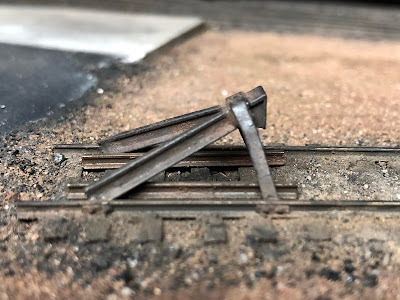 The two short pieces of rail were painted first with a couple of coats from a Woodland Scenics paint marker to see if that base would work differently, and it is slightly different. Looking at the pictures more closely, I'll probably lengthen the short rails that are inside the bumper. I also didn't do anything to model the interior brackets that connect the bumper to the rail. If you wanted to include those, I'd probably use small pieces of brass, bent to shape, and soldered into place between the rail and the bumper. But they aren't very visible. 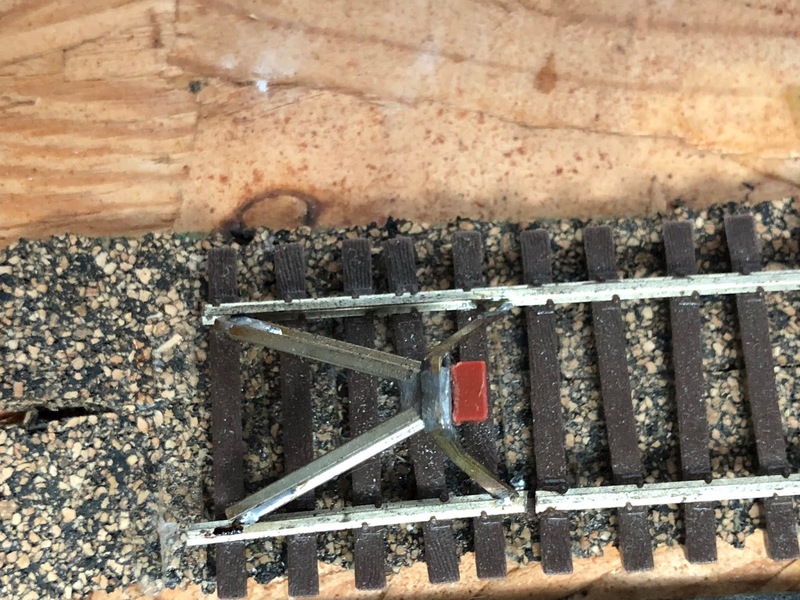 Note that the Tichy one also includes the brace/spacer/connector that runs between the railroad ties. 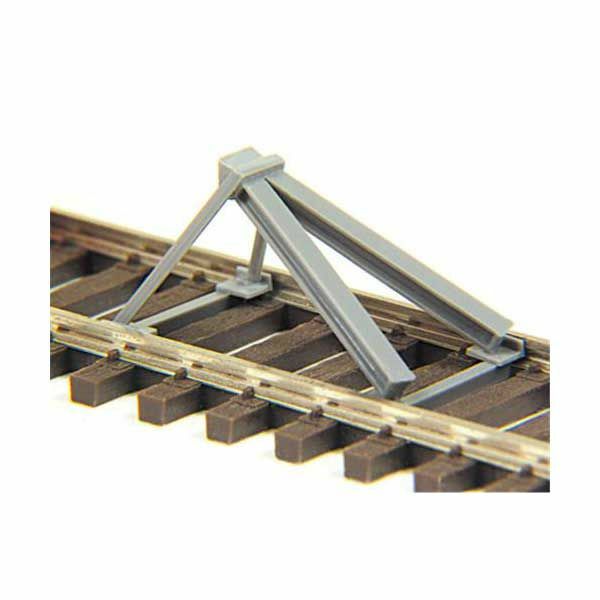 Those would also be easy enough to include, either of styrene or brass. 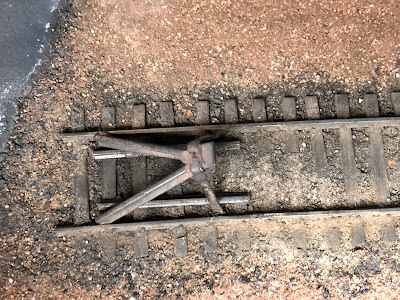 I should have also paid a little closer attention to the location where the various components connect to the rail, since the rear of mine is over a tie instead of the space between them where this connecting piece would be. 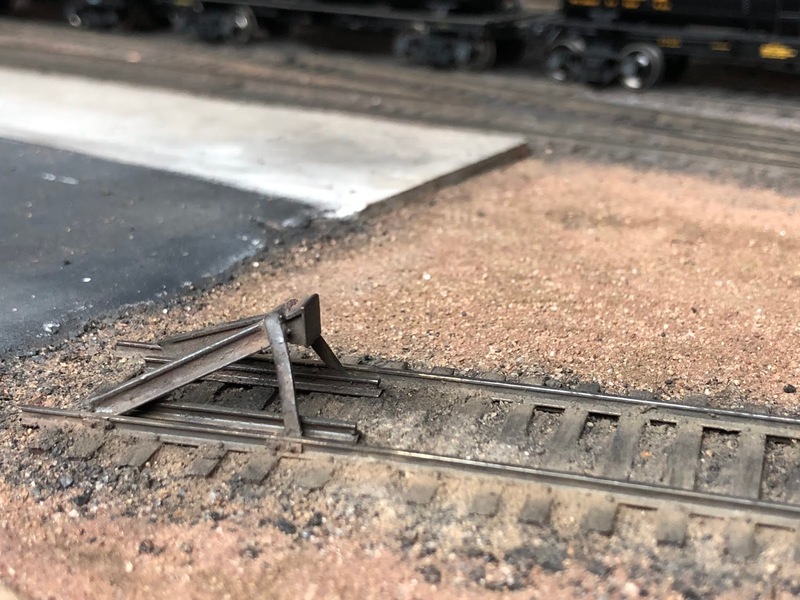 Regardless, I'm happy with the results, and it highlights my general approach of treating the rail infrastructure as among the most important scenery on the railroad.